My father, my friend Hector Orellana. In his young years he lived life with out limits just in having 8 children we could see that he lived a very promiscuous life during his young adult hood. When he finally settled down, he married a lovely young girl by the name of Enma de Leon. Together they had three children my older sister Angie, my brother Willy, and me. The Lord allowed him to see the world through his ability to create as a carpenter. The Salvation Army opened door for mission work in the Congo, Estonia, Marshall Island, Alaska and parts of Mexico. In these locations he helps build schools, furniture, and housing. 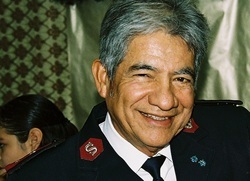 He was involved with The Salvation Army over thirty years, having a hart for God and a hand to man. He enjoyed serving and meeting psychical and spiritual needs of all those who he meat. He dreamed of retiring and having the opportunity to do more traveling and the hopes of spending more time with family. Everything seemed to be falling into place for the upcoming retirement date as the excitement grow more and the day come closer. We prepared to have a recount of his life and a look back at all that God had allowed him to do. December 3rd 2010, it was a Friday when I got a call very early in the morning. It was my Mom asking me to rush home, something was wrong with my Dad. Once I got home things seem to be as normal, I tried to take him in to get checked out but he would not go. My Dad had typed 2 Diabetes "Diabetes is a chronic condition that occurs when the body cannot produce enough or effectively use insulin" (IDF) he attribute the morning events to that. However, that was not the case he went to the Doctors at three, come back to work and was fine. At six the Doctor called him and told him to go to the hospital because he was having a Hart Attack which is a sudden and sometimes fatal occurrence of coronary thrombosis, which typically resulting in the death of part of a heart muscle. Once at the hospital he had two bypasses to the heart and they were successful, but during the next days his liver slowly stopped working. He was promoted to Glory on Monday December 6th 2010. It happened all so quickly and unexpectedly he did have Diabetes but tried to live as healthily as he could. We were blessed to have him in our lives for the time that we did, he is missed so very much. The recount of his life and look back at all that God had allowed him to do was showcased at the Celebration of life service that was held for him.